Sometimes it's hard to know what gift to buy someone. For the person that seems to have everything already, just remember, you can never have too much ammo! Give the gift of ammo without having to do all the invasive digging to figure out favorite ammunition brands or what calibers are needed. Buy a gift card instead and know that your recipient will get exactly what they wanted. How many gifts can hold that claim?! 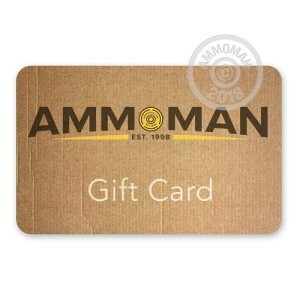 Sending a gift card to AmmoMan.com is easy. Simply select if you want to receive a notification about the gift card yourself and pick one of our popular gift card amounts --- or name your own! We'll do the legwork and let your recipient know they have something special coming from you!